When endurance rider and divorcee Bethany witnesses a murder at a highway rest area, she’s forced to elude the killers while locating the victim’s son to pass on documents as the victim requested. Told to trust no one, she struggles to create a new persona in order to hide her identity from the killers as she takes on the challenge of finding widower Roger Meadows, the handsome son of the murder victim. She manages to overcome her shyness to become a sassy redhead whose bold personality allows her to meet and intrigue Roger while avoiding those who are hunting her.They learn to trust each other as they delve into the death of his father and work to avoid the killers. It is a desperate ride at the end of the story that provides the information needed to solve the mystery and cement their love. This novel appeals to readers of Suspense, Romance and Mystery. The characters are rich and believable as is the plot and locations. Celebrating and reflecting the values of small town America in the background while the characters struggle to solve the mystery surrounding the death of Richard Meadows. 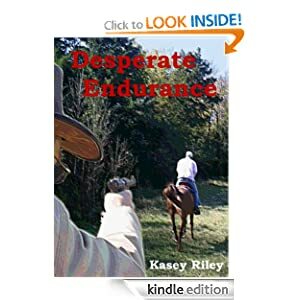 Kasey Riley is a writer whose strong background of endurance riding has led her to create a novel that will appeal to those who enjoy a good mystery and to those who love animals. She has a unique touch in dealing with her sport and an insight to fellow competitors. The horses, the Ride camps, the challenges of the trail - all are taken from real experiences. Living in a town of less than 15k population, she has a handle on small town living and relationships of the residents. All of this combined with her love of riding and her skill at relating to her readers has developed her as a writer just waiting to be enjoyed. She has been published back in the early 1990's and won awards from an equine manufacturer for essays submitted about their products. Her writing career has been on hold while she pursued a career first with the Postal System and later as a business owner. Now that she has time to devote to her first love, she plans to write several books with the fictional town of Riverview as a center point and some of the same characters being part of the story in each. Look for her next mystery, The Skeleton Trail, some time in 2014. Desperate Endurance is Endurance.net's Book of the Week!